Top 5 Update: A no-brainer peanut butter cookie recipe that actually tastes good. Today’s Flourless Peanut Butter Cookies recipe comes from Taste of Home via a blog called Food, Family and Friends. 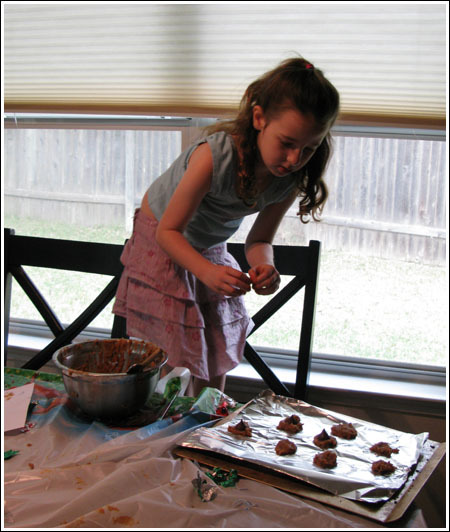 It’s a great recipe for kids who are on holiday break and looking for something to do. This required very little adult supervision. I put all the ingredients on the table, gave the girls a copy of the recipe and told them what to do. To make things easier, I pre-measured the peanut butter, sugar and egg, but let the girls have the super swell job of unwrapping the Hershey’s Kisses. What’s great about these cookies is that along with providing 30 minutes worth of entertainment, they’re really good. They are on the sweet side, so it’s best to use a peanut butter that’s not too sweet. I used Smart Balance, but I think Skippy Natural would be a good choice too. Preheat oven to 350 degree F. Line two cookie sheets with foil. Mix together the egg, peanut butter, vanilla and sugar. Our dough wasn’t thick enough for rolling, so we just dropped mounds of it on the cookie sheet. Sprinkle with cinnamon sugar if desired (we didn’t). Bake one sheet at a time for 12 minutes. 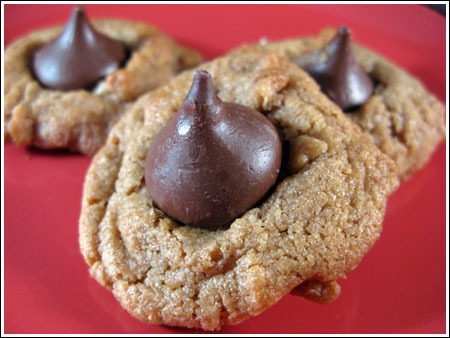 Pull the cookies from the oven and quickly stick a Kiss in the center. Let sit on cookie sheet for 3-5 minutes; transfer to a rack to cool. **The original recipe calls for 1 cup granulated, but I used a mixture of 2 parts granulated and 1 part brown. Since brown sugar weighs a little more than granulated sugar, use 2/3 cup granulated sugar and 3 tablespoons of brown or use any combination you like, but weigh out 7 oz. Hi Kristen! If you wrap them tightly they should be okay. However, what you could do (and what I have successfully done) is freeze the dough and then bake the cookies up fresh. I’m wondering how these cookies would freeze. Do you think the chocolate Kisses would get discolored? These look wonderful! Can’t wait to try the recipe. Thanks for sharing. Without planning to I ended up making these today. I didn’t think I’d bake anything and now we have these. They’re tasty and sooooo easy to make. Thanks Anna! Made these (slightly different recipe) today with my son! Always a favorite. Oh my I love those. I made the classic Pillsbury recipe last week. Hi VG, do you have a vegan version? Rita, she was sort of focused. Her favorite thing to make is actually chili. Kelly, we’ll have to try those. Shoshanna, I almost made a second half batch with Barney Butter (almond butter) but ran out of sugar. I’m going to try it as soon as I get the sugar. That’s another good one for kids. Thanks for the reminder. I have the urge to bake a cherry pie, so that’s next on the agenda today. I’ve been letting my 7 year old make Magic Cookie bars. I make the crust since you have to melt butter but she pats it in the pan and does all the rest. We’ve made about 6 pans of it this month. These look good, fun and easy. What a great combination. Do you think they would work with a different kind of nut butter (like almond)? I like to use Brach’s stars. No unwrapping needed! SO fun!! I love those cookies.